The ocean swirled around the boy and pulled him down with unrelenting power. Heavy water churned and tugged at his flailing body like unseen hands yanking him into the watery depths. The fight was finally over. Even though he’d tried to stand up to the enemy, the waves were about to swallow him whole. The last thing ten-year-old Corey remembers (before the world as he knew it disappeared) was the searing pain in his head after falling while chasing his dog Molly into the woods. What happens next can't be explained as Corey wakes up and finds himself face-to-face with not one but two lions! 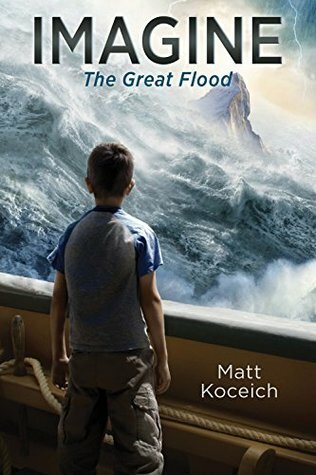 Imagine. . .The Great Flood is the first release in an exciting, brand-new epic adventure series for kids ages 8 to 12 written by schoolteacher and missionary, Matt Koceich. The Imagine series brings the Bible to life for today's kids as they ponder what it would be like to live through a monumental biblical event. Watch for Imagine...The Ten Plagues in March 2018! "Imagine The Great Flood" by author Matt Koceich is a juvenile fiction book. With only 110 pages this is a short adult read to children book. It is powerful and I can see how this would be the perfect bed-time story read as the Bible comes to life for children of all ages as they wonder what it would be like to live through the time of Noah and his family. This book is descriptive, actions packed and the way the story unfolds will captive the hearts of children as they think they are going to look for Millie, Max's dog, but they end up in a adventure of a story. I love how the author took creative liberties in writing this book, but didn't take or add anything to the Biblical story, which is important to me. I cannot wait for more stories for the Imagine series. This is one that I will be collecting for my future children. Thank you to the publishers for providing a complementary review and I was under no obligation to post a review. I give this book 5/5 stars. I cannot wait to read more!